How do I order Swing Seats, Pergolas, Benches, Rockabyes and Swinging Day Beds? How do I order your bespoke rope swings, ammonite tables or milking stools? Do you make chairs and benches to match? Do you actually make Pergolas? Can I secure my High Oak Frame or Trilogy Swing? Can you deliver and assemble? A.It will depend on how well they are looked after .Regular cleaning of the unpainted ones to remove algae and dirt and care in siting to avoid bare ground contact and tightening the fixings will really extend the life.Similarly, on the painted ones regular ( Maximum every 3 years )rubbing down and repainting paying particular attention to the top joints on the frame is highly recommended. Q. How long will it take to make? A. Rope swings normally delivered within 2 weeks, all other products take 4 weeks and we can also deliver and assemble within that period. We do always hold a small stock for those last minute surprise gifts. Ring Martin on 01297 443084. Q. How do I order Swing Seats, Pergolas, Benches, Rockabyes and Swinging Day Beds? A. We have years of experience making bespoke products and we’ve spent a lot of time making our order process as pain-free as possible. All products can be easily ordered online. 1. Having browsed either the website or the brochure you may have started the selection process but have some questions. 2. The best way to answer these is either by visiting this FAQs page or calling us on 01297 443084 daytime or 07837 651283 or email us. 3. The best way to place an order is online via our website or ring us on 01297 443084 or 07837 651283 and either Martin or Siobhan will answer and they will only take your order once you are entirely happy. Or email Martin (as above) and he will call or email you back (we’re very good at special secret surprises and we nearly always have something in stock if you need something in a hurry). 4. If you are entirely happy to proceed we will take your £250 deposit and your commission is then accepted and confirmed back to you in full for you to check. We only proceed when you have confirmed everything is correct. 5. Once the commission is complete we will then contact you either by email or post with pictures of your actual piece photographed in one of our workshops together with your final invoice, which we will ask you to pay the balance owing, prior to delivery. This process normally takes about 4 weeks. Q. How do I order your bespoke rope swings, ammonite tables or milking stools? A. To buy online click the links or call us on 01297 443084 daytime or 07837 651283 evenings and weekends or email us. Q. Can I hang a swing seat from a Pergola? Q. Do you actually make Pergolas? Q. Can I hang a swing seat from a tree? A. Yes of course. Please visit our tree page for detailed information. Q. 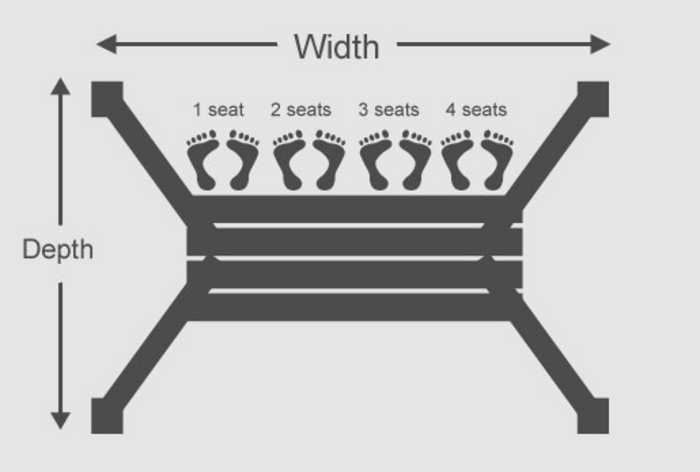 What is the footprint of a swing seat frame? Note normally frames are 2.0m high. A. See the diagram and table below for answers. Footprint of all Frames and Pergolas. Q. What sizes do you make swing seats in? A. By using our buy online option you can build a price on your selected range and only when you are happy to proceed will we need your details and deposit. Q. What accessories do you offer? A. Ammonites, Carvings, Cushions, Ageing Process, Drinks shelves, Drink Tables & Suspension springs. To view our accessories page please click here. Q. Can you deliver and assemble? A. Chargeable delivery and assembly is available for swing seats and frames - we will quote for this at the same time as your seat. We use a local removals company who will deliver, assemble and adjust to your own personal fitting. We can now offer an onsite build option on pergolas and Swinging Day Beds and would be subject to individual quotation. Q. Can I secure my High Oak Frame or Trilogy Swing? A. If you find that after vigorous swinging the frame does “lift” a little, we are able to recommend an excellent, simple, fixing down kit, here is the link. You need to select Kit SK311. Q. How do I get a detailed quote? A. Simply click here to get a quote. Q. What are my options for the back of my swing seat? To see the designs click here. Q. What about colours on your painted range? A have a look here. Q. Do you make chairs and benches to match? A. Yes we do, visit our benches & chairs page. We believe in the quality and craftsmanship of our work and in the materials that we use. We offer a full money back satisfaction guarantee if you are not entirely happy with any Swing Seat you purchase from us. Return any product within 14 days of delivery for a full refund of the purchase price including the return delivery cost. All our products come with a full 12 month warranty against defects in materials or workmanship.Neither the guarantee nor the warranty affect your statutory rights. All Accoya products have a 25 year timber warranty underwritted by Accoya.